Pharo is a fascinating lively object oriented environment that allows you to turn programming ideas very quickly into real usable programs and tools. While it took years for Microsoft to finally provide multiple desktop support in recent Windows version 10 it only took a few hours for the author of this article to implement such a feature in the Pharo environment. 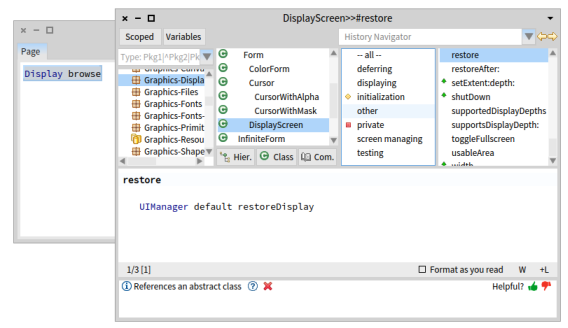 This article explains how Pharo was extended with support for multiple desktops — from basic experiments up to the final code. It also gives an overview on how to use this new “DesktopManager” goodie. In the tradition of Smalltalk systems Pharo is based on an image concept — a single file including the whole object world that could be run easily on different devices and operating systems using a virtual machine. The native virtual machine adapts the Pharo environment to the current runtime (Windows, Linux, Mac, Android or others) and allows you to easily develop on one system and run on another very easily. 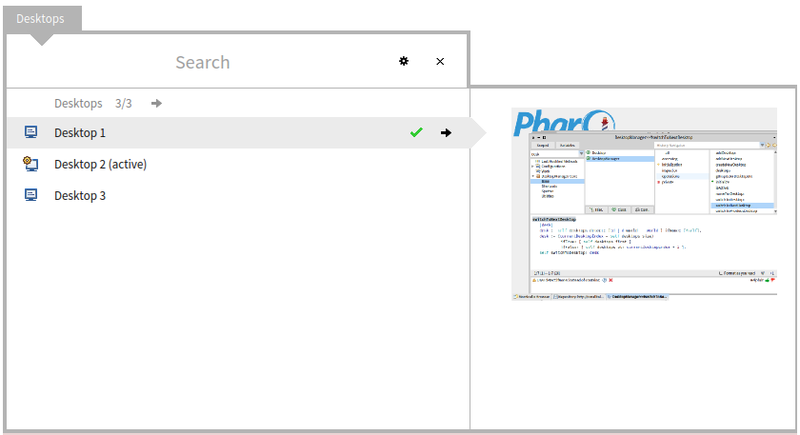 You can develop on a Windows, Linux or Mac laptop and later run the Pharo program 1:1 on a completely different device like the Raspberry Pi. It is even possible to debug a program failure on one machine and continue debugging on another. This allows also for fascinating possibilities like developing web application locally and just pushing the image with the running program later onto a server to quickly publish into a cloud. This comes with increased productivity but also allows for easy maintenance — if you want to find and kill a bug in an application you can even save, download and restore a copy of the whole environment while the failure happens. So the whole Pharo object world could be freezed and saved at any time into one or more image files — allowing you to quickly make snapshots, copy them around and continue work at any point in time. All this is an old Smalltalk tradition that now gets new attention also in modern virtualization technologies. So Pharo is a like an easy transferable operating system moveable between systems and devices. Within this single native window (that is hosted by the underlying OS) our Pharo environment provides its own UI implementation — including its own windowing and graphic system. This way the implementation can be kept independent from the current runtime. 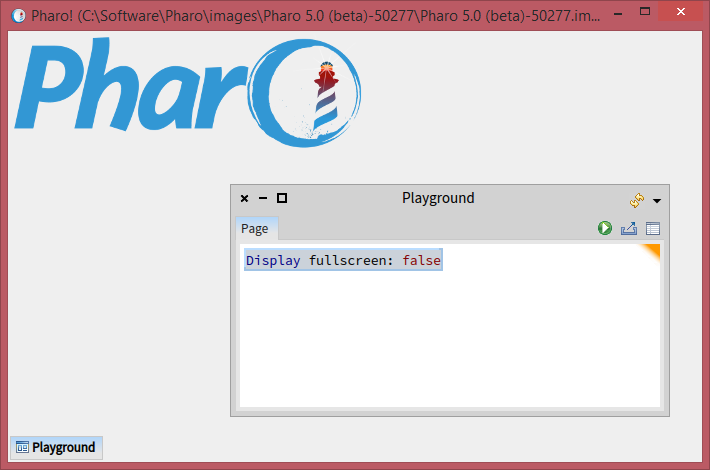 So Pharo looks and behaves like an own desktop operating system itself. There is even a setting in the default settings browser to run the system full screen and a WorldMenu > Windows > Toggle full screen mode item. To explain: the Smalltalk programming language itself consists of objects and messages and with its pure object oriented nature it should be easy to understand this simple piece of code that is very close to english language. When evaluated this snippet sends the keyword message #fullscreen: with the argument object true to a globally known object called “Display”. If you set Pharo to full screen using this expression you can forget about the underlying Windows, Linux or iOS completely and make Pharo your own custom operating system. and pointing your browser to http://localhost:8080/ — you will see that some new worker processes/worker threads will be created. 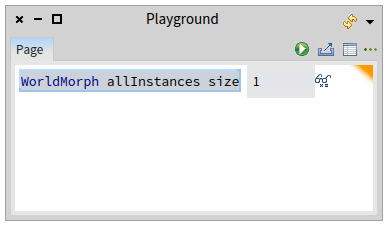 If you like to know more just read about concurrent programming in Pharo. With an own process implementation Pharo implements an object oriented multi-tasking operating system and while developing you stay independent from native process or thread implementations as much as possible. As the previous examples showed Pharo has very much in common with an operating system. The difference is that it is more a lively kernel and scriptable object system that one can easily persist and transfer and that is easily extendable using the Smalltalk language. 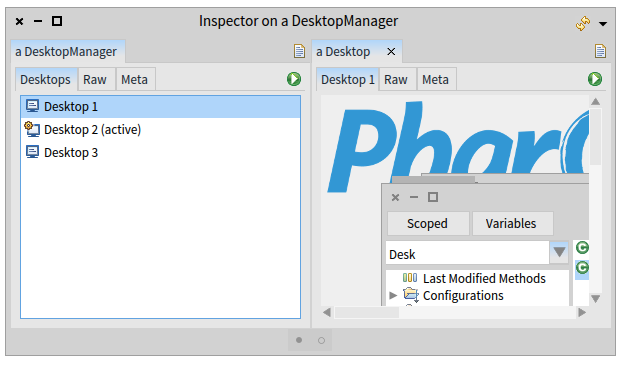 But if Pharo is some kind of modernized operating system then something is missing: Pharo has its own windows system with themable user interface but Pharo does (at the time of the writing) by default not support the concept of multiple desktops. 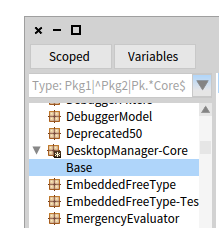 What would it require to implement multiple desktop support in Pharo ? One has to know that Pharo is still based on a UI system called Morphic. Morphic itself is based on some nice ideas — but it also had some design flaws and years ago when Pharo forked as its own open source project from the Squeak Smalltalk system the morphic code was in a horrible state. Fortunately the Pharo community was able to clean the dark sides as much as possible to make it less painful and also a replacement for Morphic called “Block” and “Brick” is already in the pipe. If we want to have a code browser showing us the methods this class supports we can do by simply sending the message #browse to an object. Side note: usually one opens the tools like browsers using menu or shortcuts. But using the #browse method is also very handy if you do not yet know about the class of an object you work on. Reading a little bit the methods on the class and instance side of WorldMorph there were two methods that got my special attention: one was an instance method called #install to install an existing world object and one was a class side method called #installNewWorld. So it is already possible to have new worlds and install them. Yay — lets move on! 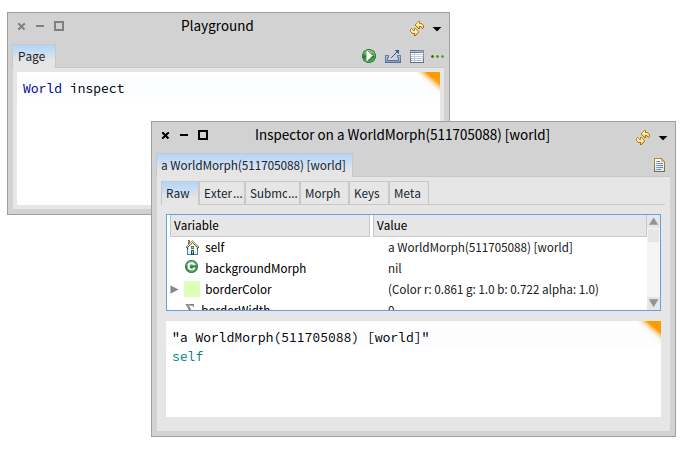 Nice: I got a list of several morphs including the Pharo windows that are currently open. There is even a TaskBarMorph instance as a submorph in our world representing the task bar at the bottom. Using the inspector it was easy to dive deeper into the world structure and using the class browser understand more about their implementation. I was able to switch between the two worlds already. Nice! Still cumbersome — but it works. Having this knowledge we can now move on in finding a design for a goodie to create and manage multiple worlds/desktops in Pharo. In programming languages like C++, C# or Java a class usually would be defined in a source code. A class definition file (Desktop.cpp/ Desktop.cs/ Desktop.java) in these languages would be a dumb text definition file fed into a compiler to verify and translate. In an interactive and lively system like Pharo a class could be created like any other object by sending instance creation methods. The reason is simple: in a pure OO environment anything is an object, so even a class is an object. Remember: there are only objects and messages. desktops := OrderedCollection with: (Desktop world: World). So initially we have a collection of one desktop referencing the current World. As this one is also the active desktop our index needs to be 1. 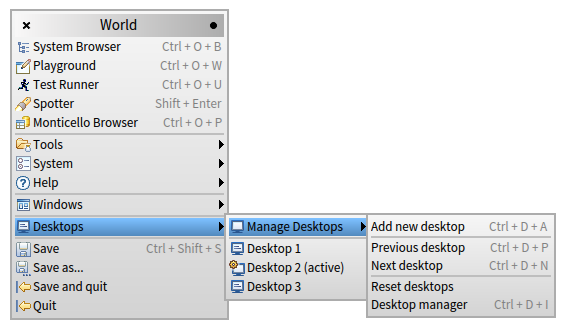 Another design decision is that there should only be one desktop manager in the system. So we implement a class side #soleInstance method returning the singleton. This is by far more easy to remember than the previous expression. Please check the full source code for the details. 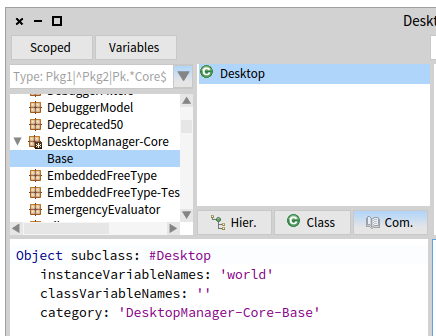 The global world menu of Pharo not only allows you to access the various tools available - it also allows to deal with “Windows”. This lead to the idea to also have a custom menu showing the various active/inactive desktop(s) and allowing you to add new. Fortunately this could be easily provided by implementing methods including the <worldMenu> pragma. A custom class DesktopKeymapCategory was implemented quickly with a few methods using a predefined system pragma <shortcut> definition. Navigation using the keyboard helps — but often you can not see how many desktops you have. A preview would be nice as well. How to do that? Pharo again comes to the rescue — thankfully the more recent versions (Pharo 4 onwards) now include so called “moldable tools” — that means UI related tools you can easily (re)use within your own application. This method uses the <spotterOrder:> pragma and provide a list of desktops for searching/navigating in the spotter tool. This basically creates a form/ image representation of the world the desktop points to. The calculation is only done to scale the preview image keeping the original image ratio. so you have to hold down CTRL and keep pressing D two times to open the newly implemented tool. in a playground or workspace. 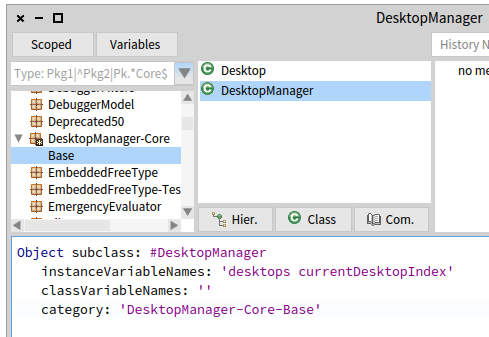 The whole desktop manager goodie took only a few hours to implement. For sure it could be even more improved. But actually this article took more time to write than the current code and the result is fantastic: one can have multiple desktops in Pharo and can navigate them using keyboard, menu or the custom spotter. This again brings Pharo closer to be used as an independent but yet powerful object oriented operating and runtime system.